Nowadays, as never before, a greater number of Americans are suffering from asthma. It is one of this country's most widespread and costly diseases. In fact, according to the Asthma and Allergy Foundation of America, every day 40,000 people are absent from school or work because of asthma; 30,000 people experience an asthma attack; 5,000 people are seen in the emergency room due to asthma;1,000 people are admitted to the hospital due to asthma; and, 11 people die from asthma. Allergens or irritants that are inhaled into the lungs can create inflammation that clogs and constricts airways, are routinely the cause of asthma symptoms. Symptoms include difficulty breathing, wheezing, coughing, and tightness in the chest. In severe cases, asthma can be deadly. 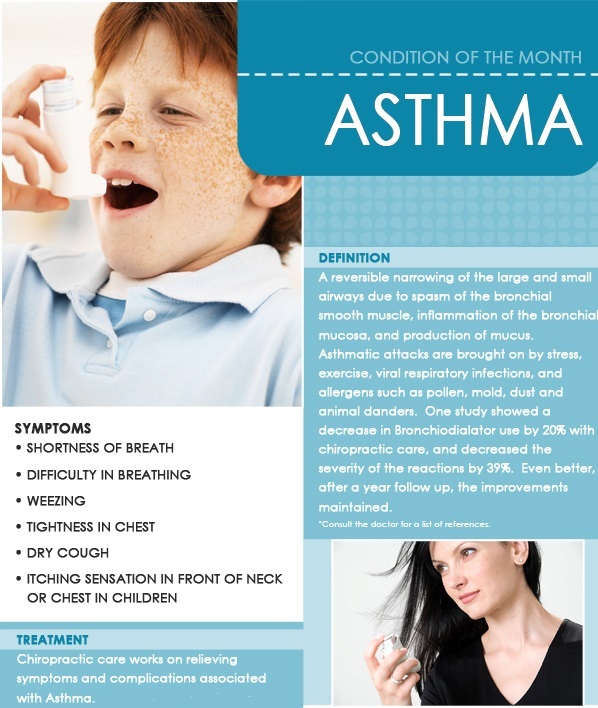 Medication may temporarily reduce the symptoms of asthma; however there is no medical cure. Although chiropractic is not a therapy for asthma, per se, current research published in the Journal of Vertebral Subluxation Research documented the results experienced by 81 children with asthma who were given chiropractic adjustments. The two-month study disclosed that those under chiropractic care saw a 45% decrease in the number of "attacks" and that 31% of the subjects voluntarily decided to take less of their medication. What is the technique by which chiropractic care lessens the frequency and severity of asthma attacks? How can an adjustment of the spine affect respiration? Chiropractic adjustments get rid of nervous system impedance. The majority of nerves that are in charge of bodily functions are routed to their destinations after exiting between the spinal vertebrae. The nerves that affect the respiratory system are included in this network. If impeded, nerves that regulate the diaphragm can have a serious effect on how vigorously the respiratory system functions. It shouldn't be surprising, then, why so many adults and children receiving chiropractic treatment report augmented breathing and a decline in their asthmatic symptoms.